MSM (Methylsulfonylmethane) is a natural form of organic sulfur found in all living organisms. This natural compound, researched since 1979, provides the chemical links need to maintain numerous different types of tissues found in the human body, including connective tissue such as articular cartilage. While MSM is a natural component of almost all fresh fruits, vegetables, seafood and meat, food-processing methods reduce sulfur levels, making supplementation more important than ever. 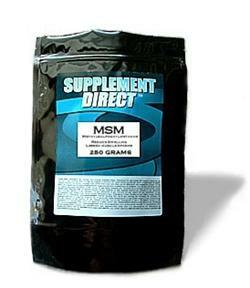 Supplement Direct MSM is tested to meet a minimum 99.7% purity level. Directions For Supplement Direct MSM: As a dietary supplement, take 1-2 1/4 teaspoon one or more times daily as needed, preferably on an empty stomach or use as directed by a health care professional. Methylsulfonylmethane (MSM) is a naturally occurring sulfur compound and nutritional component of many foods. It is found in the normal diets of humans and almost all other vertebrates. The proper chemical name for MSM is dimethyl sulfone. It is the primary, oxidized metabolite of dimethyl sulfoxide, and it appears to share many of its parent compound’s therapeutic properties. MSM belongs to a family of compounds that are abundant in the food chains of terrestrial and ocean life. This sulfur-containing nutrient is the stable end product of the methyl-S-methane series of compounds that provide bioavailable sulfur to as many as 85% of all living organisms. These compounds—principally dimethyl sulfide (DMS)—are among the Earth’s few primary sources for sulfur. The sulfur cycle begins in the ocean, where algae and phytoplankton release sulfur compounds, called tertiary dimethylsulfonium salts. These salts are transformed to DMS, a highly volatile compound. Oceanic DMS is the major natural source of sulfur to the atmosphere and contributes both to the tropospheric sulfur burden and to particle formation and growth in the atmosphere. MSM has been shown to be safe by several studies. In thirty years there have been no reported adverse events to MSM. It’s also important to note that sulfa allergies do not apply to MSM. Published scientific studies have shown MSM to be safe for human and animal use. Even at large dosage levels, there are no known significant adverse effects or drug interactions. Notably, these studies were conducted on highly purified forms of MSM; consumers should determine if the MSM they use has been appropriately processed to remove microscopic toxins or impurities. There have been no reported cases of allergic reactions to MSM in the medical literature, though there are a handful of unpublished anecdotes of minor side effects like loose stools, stomach upset or skin rashes, conditions which disappeared immediately after stopping the supplementation. Dr. Stanley Jacob M.D. of the Oregon Health & Science University reports treating over 18,000 patients in his medical practice, some of whom where given very high dosages, without adverse effects. Horváth K, Noker PE, Somfai-Relle S, et al. Toxicity of methylsulfonylmethane in rats. Food Chem Toxicol 2002; 40:1459-62. Goldstein P, Magnano L, Rojo J. Effects of dimethyl sulfone (DMSO2) on early gametogenesis in Caenorhabditis elegans: ultrastructural aberrations and loss of synaptonemal complexes from pachytene nuclei. Reprod Toxicol 1992; 6:149–59. Concern has been raised based on the results of this in vitro study, which found meiosis was interrupted in early gametogenesis in the nematode Caenorhabditis elegans (C. elegans is a small (about 1 millimeter), primitive worm that shares certain essential biological characteristics with humans (e.g., it produces sperm and eggs, reproduces, has a nervous system, etc.). Its short lifespan, rapid development, and easy cultivation under controlled conditions make it a favorite of research scientists as a model for toxicologic assays.) when it was grown in concentrations of MSM exceeding 1%. Increasing concentrations of MSM impaired the fecundity and viability of treated worms. This study is actually attempting to suggest the possibility of a teratogenic effect. However, more definitive research has shown no teratogenic effects or developmental toxicity. Lin A, Nguy CH, Shic F, Ross BD. Accumulation of methylsulfonylmethane in the human brain: identification by multinuclear magnetic resonance spectroscopy. Toxicol Lett 2001; 123:169–77. In vivo magnetic resonance spectroscopy (MRS) was used to detect and quantify MSM in the brains of four patients with memory loss and in three normal volunteers all of who had ingested MSM at the recommended doses of 1-3 g daily. MSM was detected in all subjects at concentrations of 0.42-3.40 mmole/kg brain and was equally distributed between gray and white matter. MSM was undetectable in drug-naive normal subjects (N=25), patients screened for 'toxic exposure' (N=50) or patients examined with 1H MRS for the diagnosis of probable Alzheimer Disease (N=520) between 1991 and 2001. No adverse clinical or neurochemical effects were observed. Appearance of MSM in significant concentrations in the human brain indicates ready transfer across the intact blood-brain barrier. Hixson O. Acute intragastric toxicity (LD-50). Dimethyl sulfone (methylsulfonylmethane, MSM). Laboratory of Vitamin Technology, Inc., Chicago, Illinois, August 21, 1958. Study to assess acute intragastric toxicity of MSM. LD50 could not be established because even the maximum dose of 20g/kg failed to kill any of the animals (n = 10); no adverse effects were noted (the maximum recommended dose in humans approximates 300mg/kg). MSM Toxicity in rats: The first and only toxicology study of MSM to be published in a peer-reviewed journal. Published in the Journal of Food & Chemical Toxicology. GLP-compliant. No adverse effects were noted in either acute or subchronic (90) studies at dose levels of 2 g/kg in the acute phase and 1.5 g/kg in the subchronic phase. Toxicology, lab, gross pathology, histology were all negative. Rose SE, Chalk JB, Galloway GJ, Doddrell DM. Detection of dimethyl sulfone in the human brain by in vivo proton magnetic resonance spectroscopy. Magn Reson Imaging 2000; 18:95–8. Schoenig G. Acute oral toxicity of sample No. 751, dimethyl sulfone 1 BT No. A6409. Industrial BIO-TEST Laboratories, Inc., Northbrook, Illinois, September 19, 1968. MSM occurs naturally in many common foods such as tomatoes and milk. However, its concentrations are so small that it is not feasible to commercially "extract it from nature." Commercial MSM of high purity is chemically identical to that found in nature. All MSM is manufactured using a chemical synthesis process of reacting two raw materials, dimethyl sulfoxide and hydrogen peroxide. This reaction forms a new molecule: MSM or dimethyl sulfone. After reaction, a purification process is needed to remove any impurities from the MSM. Two commonly accepted purification processes used in most chemical and food processing plants are distillation and crystallization. Distillation is the favored process for producing high purity MSM, where heat is used to separate compounds by their unique boiling points. MSM has a boiling point of 478ºF. The distillation of MSM results in a very pure product. Conversely, purification by crystallization can be adversely affected by the use of impure solvents, potentially leaving undesirable or toxic by-products. If MSM is not manufactured properly, or is produced in a facility that makes multiple products with improper sanitation procedures, contamination is likely. There may also be a chance that impurities (such as heavy metals or chlorinated hydrocarbons) from the water used in the synthesis and crystallization process will remain in the final product. Other factors that determine the purity of synthesized MSM is consistent product formulation and strict process control procedures. A good MSM manufacturer uses in-process control and rigorous product testing to ensure the product is indeed pure. The nutrition industry has established standards for testing MSM material so that all manufacturers use the same types of procedures and instruments for testing. These standards are developed by AOAC International, an independent, NIH-sponsored, FDA-endorsed international community of analytical chemists. Industry guidelines recommend that raw material and finished products manufacturers use these accepted methods to ensure consistent quality. These methods establish "a gold standard" by which all products can be uniformly measured. High Resolution Gas Chromatography (HRGC): a highly specific quantitative method that determines the volatile purity of MSM. Melting Point: reveals non-volatile impurities not detected by HRGC. This is a very important test. Some manufacturers claim that their MSM is "99.9% pure", but they are only referring to volatile purity testing. That same MSM could contain 50% Epsom salts or some other non-volatile impurity and it would not affect the " 99.9%" volatile purity rating. Therefore, tests of non-volatile purity, such as melt point, are critical to confirm volatile purity results. KFT: (Karl Fischer Titration Method) Pure MSM should be extremely dry, with a water content of less than 0.1%. Metals Testing: heavy metals; Arsenic, Cadmium, Mercury and Lead, as well as the metal Aluminum. Water is a key component of the MSM production process. Some foreign MSM production facilities are located in areas where local water supplies do not meet U.S. Federal guidelines for organic and inorganic volatiles, heavy metals, and other contaminants, making heavy metal testing essential. Microbiological Testing: for aerobic bacteria, total coliforms, and yeast and molds. Poor water quality can lead to coliform and bacterial contamination. Too much moisture in the product can lead to yeast and mold contamination. In the U.S. MSM is regulated as a dietary supplement. Dietary supplements are regulated by the U.S. Food and Drug Administration (FDA). The FDA requires that product claims ("structure and function claims") are truthful, not misleading and supported by scientific studies. The FDA has the right to recall or ban dietary supplements that are found to be unsafe. The FDA requires that all dietary supplements are manufactured in accordance with Good Manufacturing practices (GMPs) using documentation and consistent methods. Information about FDA regulations can be found at the FDA website. In other countries, MSM is also federally regulated. In Japan, MSM is regulated by the Pharmaceutical Affairs Law. In Canada, MSM is regulated by the Natural Health Products Directorate, a division of Health Canada, the Canadian equivalent of the FDA. The Canadian government provides a unique product registration number and approval for products to be marketed in that country. Regulations in other countries vary. Q: Where does MSM come from? Does MSM come from pine trees? A:All commercially available MSM is manufactured by reacting dimethyl sulfoxide with hydrogen peroxide. The raw materials used to synthesize MSM have many sources, including plants or other organically-based material. The source of these raw materials has no relationship to the end product of MSM. A synthesis process produces MSM that is chemically identical to that which occurs in nature. There is no commercially viable way to "extract" MSM in quantity from any organic or plant source. Methyl groups may originate from plant sources, such as the processed pulp of Southern Pine, but the sulfur does not. Although MSM is a naturally occurring sulfur compound, the microscopic amounts occurring naturally in food are too small to permit "extraction" sufficient for commercial production of dietary supplements. The most "natural" MSM would be that which is closest to what is found in nature (i.e., the purest MSM). Purity of MSM is achieved by distillation or crystallization. Distillation is universally accepted as the superior purification method. Read more in MSM Manufacturing. Q: How does MSM work? A:The exact mechanisms of how MSM works are still being identified in ongoing scientific research. However, scientific studies have now confirmed that MSM is a safe and effective anti-inflammatory agent. It may also contribute to the integrity of joint cartilage and other connective tissue. In recent animal research conducted in Japan, MSM was found to act as an immunomodulator, preventing the immune system from mounting dangerous autoimmune responses to noxious stimuli. See study. It also prevented local inflammation to a significant enough degree as to halt an autoimmune reaction at the genetic stage of induction. It appears to affect autoimmune responses, such as the immune system's development of antibodies against its own tissues. MSM has been shown to inhibit the development of abnormal antibodies to collagen, and to prevent production of rheumatoid factor and antinuclear antibodies (ANA). Though the pain relieving properties of MSM are well known, mechanisms by which it accomplishes this are still under investigation. MSM most likely inhibits inflammatory prostaglandins and leukotrienes, hormone-like substances that create inflammatory cascades in the body associated with pain production. MSM's effects on connective tissue are also well known. It is presumed, though not proven, that the beneficial clinical effects noted in humans on skin, hair, nails, and joint cartilage (as well as on hooves and coats in animals) has to do with MSM's sulfur content. Sulfur is abundant in connective tissue, and sulfur depletion in connective tissue is known to lead to problems. Because MSM is 34% sulfur, it is likely that the integrity of connective tissue is enhanced with MSM supplementation. MSM's benefits are those of a dietary supplement. It should not be used to treat serious diseases unless under the supervision of a medical doctor. Q: Can I take MSM if I am pregnant? A: There are no known adverse side effects from use of MSM immediately prior to and during pregnancy or during breast-feeding, however use of MSM among this group is highly discouraged. Women of childbearing age who intend to become pregnant or who are pregnant or breast-feeding should always consult with their physician before taking any supplement or medication. Q:I am allergic to sulfur. Can I take MSM? A:Strictly speaking, the concept of a “sulfur allergy” is a misconception: sulfur is an element, the third most abundant mineral in the human body. It's not possible to be allergic to sulfur because it has no protein component. When people say they are "allergic to sulfur", what they really mean is that they are allergic or sensitive to certain sulfur-containing substances, most notably to sulfa antibiotics (sulfonamides) or to sulfites (preservatives used in wines and some foods), or to foods with a high sulfur content (broccoli or cauliflower). Many individuals with allergies to sulfa drugs or to sulfites do not experience problems taking MSM, because apart from sulfur, MSM bears no relation to these substances. However, people who are allergic to one drug are more likely to be allergic to another, regardless of its chemical structure. So if you have a known allergy to sulfonamides or to sulfites, consult with your physician before taking MSM. Q: Does MSM have any proven effects on insulin, blood sugar, blood pressure, or peptic ulcer? A: No. Sulfur is a component of many amino acids and hormones, and is required for the production of many more. But just because sulfur is required to produce insulin, it is not correct to believe that taking sulfur as a supplement (e.g., in MSM) would have any effect on the body's production or secretion of insulin. The regulatory pathways for blood sugar metabolism are far more complex than that. Q: For what conditions has MSM been tested in clinical trials? A: Osteoarthritis, seasonal allergic rhinitis (hay fever), and snoring are the primary areas of clinical studies. There are many additional studies related to MSM safety in humans. Q: Is MSM effective for allergies? Q: How much MSM can I take? Are there any side effects? A: Clinical trials have investigated doses ranging from 1,500 mg per day up to 6,000 mg per day. Stanley Jacob, MD reports using MSM in his patients at doses of up to 100 grams per day with no ill effects under highly controlled medical treatment regimens in a hospital clinic (MSM: The Definitive Guide). MSM toxicity studies indicate that these large doses do not present safety issues, however it is possible that they could result in occasional loose stools or other minor effects. Q: Is MSM depleted from foods by food processing? A: MSM is widely distributed in nature, but the amount in any given food is very small (just a few parts per million at most). Because of these low levels, any depletion from foods is insignificant. The reason to supplement with MSM is that it has beneficial effects on the structure and function of the human body, when taken in amounts exceeding dietary intake levels. MSM dietary supplements, if manufactured correctly, are extremely stable over time, even under conditions of extreme heat. Stability studies have demonstrated that some brands of distilled MSM have a shelf life exceeding thirteen years. Q: Are people sulfur-deficient? Can MSM help? A: The idea that people should take MSM because of sulfur deficiencies has not been proven scientifically. Outright sulfur deficiency is uncommon in humans because protein foods usually contain cysteine and methionine, which are sulfur-containing amino acids. Nevertheless, scientists have shown that the sulfur content of cartilage decreases as we age, and that this decrease parallels degeneration in the joints. They have also shown that certain arthritis drugs deplete the body's sulfur reserves. Separately, MSM has been shown to be a sulfur donor, and to alleviate the pain of knee osteoarthritis. Taken together, these results suggest that the sulfur in MSM is possibly being used to replenish depleted sulfur in the joints. Q: Does the body produce MSM naturally? What functions does it serve in the body? A: Yes. MSM does occur naturally in the body in small amounts. It is probably synthesized by gut bacteria, and appears to have a function in the liver’s processing of toxic agents that enter the body from outside. Q: What effect will MSM have on my skin, hair, and nails? A: Extensive anecdotal reports suggest that MSM supplementation improves the suppleness of skin and the shininess of hair and nails, which also become less prone to cracking and splitting. The efficacy of MSM has been questioned. MSM is promoted as a natural source of sulfur by the supplement and health food industry, suggesting that people are deficient in sulfur intake. However, protein in the diet is an abundant source of sulfur, which is contained in the amino acids methionine and cysteine. Clinical research on the medical use of the chemical is limited to a few pilot studies that have suggested beneficial effects. MSM is sold as a dietary supplement that is marketed with a variety of claims and is commonly used (often in combination with glucosamine and/or chondroitin) for helping to treat or prevent osteoarthritis. U.S. Retail sales of MSM as a single ingredient in dietary supplements amounted to $115 million in 2003. The biochemical effects of supplemental methylsulfonylmethane are poorly understood. Some researchers have suggested that MSM has anti-inflammatory effects (Morton et al. 1986; Childs, 1994; Murav'ev et al., 1991). Any health effects of dimethyl sulfoxide (DMSO) may be mediated, at least in part, by MSM (Williams et al, 1966; Kocsis et al, 1975). Stanley W. Jacob, M.D., of the Oregon Health and Science University, claims to have used MSM to treat over 18,000 patients with a variety of ailments (Jacob & Appleton, 2003). MSM is the primary metaboliteof DMSO in humans. Clinical evidence for the usefulness of MSM is limited to animal studies and four published clinical studies in humans. These pilot studies of MSM have suggested some benefits, particularly for treatment of osteoarthritis. Further studies would be needed to test the usefulness of the chemical as a medical therapy. Osteoarthritis: After several reports that MSM helped arthritis in animal models, a double-blind, placebo-controlled study suggested that 1500 mg per day MSM (alone or in combination with glucosamine sulfate) was helpful in relieving symptoms of knee osteoarthritis (Usha and Naidu 2004). Kim et al. then conducted a double-blind clinical trial of MSM for treatment of patients with osteoarthritis of the knee. Twenty-five patients took 6 g/day MSM and 25 patients took a placebo for 12 weeks. Ten patients did not complete the study, and intention to treat analysis was performed. Patients who took MSM had significantly reduced pain and improved physical functioning, without major adverse events (Kim et al). No evidence of a more general anti-inflammatory effect was found, as there were no significant changes in two measures of systemic inflammation: C-reactive protein level and erythrocyte sedimentation rate. The authors cautioned that this short pilot study did not address the long-term safety and usefulness of MSM, but suggested that physicians should consider its use for certain osteoarthritis patients, and that long-term studies should be conducted (Kim et al. 2006). Seasonal Allergic Rhinitis: Barrager et al. evaluated the efficacy of MSM for hayfever (Barrager et al, 2002). Twenty-five subjects consumed 2,600 mg of MSM per day for 30 days, and a significant improvement in symptoms was observed compared to those taking a placebo. However, the study was not blinded. Also, no significant changes were observed in two indicators of inflammation (C-reactive protein and immunoglobulin E levels). The authors suggest that MSM is safe for short-term use and recommend that a larger, double-blind study be performed to establish its usefulness in treating symptoms of seasonal allergic rhinitis. Interstitial cystitis: In 1978, the FDA approved dimethyl sulfoxide (DMSO) for instillation into the bladder as a treatment for interstitial cystitis. Since DMSO is metabolized to MSM by the body, it is possible that MSM is the active ingredient in DMSO treatments (Childs 1994). Snoring: Blum & Blum conducted a randomized, double-blind, placebo controlled clinical trial of an MSM-containing throat spray for snoring (Blum & Blum, 2004). The LD50(dose at which 50% of test subjects are killed) of MSM is greater than 17.5 grams per kilogram of body weight. In rats, no adverse events were observed after daily doses of 2 g MSM per kg of body weight. In a 90-day follow-up study rats received daily MSM doses of 1.5 g/kg, and no changes were observed in terms of symptoms, blood chemistry, or gross pathology (Horvath et al., 2002). Nuclear magnetic resonance(NMR) studies have demonstrated that oral doses of MSM are absorbed into the blood and cross the blood-brain barrier(Rose et al., 2000; Lin et al., 2001). An NMR study has also found detectable levels of MSM normally present in the blood and cerebrospinal fluid, suggesting that it derives from dietary sources, intestinal bacterial metabolism, and the body's endogenous methanethiolmetabolism (Engelke et al., 2005). The published clinical trials of MSM did not report any serious side-effects of treatment, but there are no peer-reviewed data on the effects of long-term use in humans. Blum JM, Blum RI. The effect of methylsulfonylmethane (MSM) in the control of snoring. Integrative Medicine 2004;3(6)24-30. Pfiffner JJ, North HB. Dimethyl sulfone: A constituent of the adrenal gland. J Biol Chem 1940;134:781–2. PDF online. Usha PR, Naidu MUR. Randomised, double-blind, parallel, placebo-controlled study of oral glucosamine, methylsulfonylmethane and their combination in osteoarthritis. Clin Drug Invest 2004;24(6):353–63.